"He's mad... we'll see his body fall at any moment." Lady Sylvia Lazarus, nicknamed Scarlet by the readership before she had an official name, was a Unaroyal Warlord. She started out as a stabber. She nearly croaked in a garrison fire in Powerstone. Queen Bea didn't consider it worth hiring a Healomancer to save her, but Jojo, a Carnymancer in Unaroyal's service had taken a liking to her. He used Carnymancy to rig the rules, allowing her to survive. After 9 turns of casting, she finally came up good as new. However, this came at a terrible price, and Jojo refused to explain the details. She would eventually be promoted to warlord. She first appeared on the Royal Crown Coalition War Council as one of the warlords planning the invasion of Gobwin Knob. She was eventually croaked by the Volcano Uncroaking. She seems to have had a preoccupation with fire, commenting at one point that she "rather hopes Parson Gotti will burn down the whole world." In addition, she seemed to believe herself to be in an ongoing competition with death, and proved herself to be willing and, in fact, eager to push her luck even against overwhelming odds in order to further Gobwin Knob's cause. It's unknown whether she had these attitudes in life, though her increasing instability was likely a side effect of decryption's Turnamancy effect and the very Carnymancy that had kept her alive. She was last seen crippled, on fire, and laughing about it following an explosion at Spacerock. She dusted in the inferno, despite or more likely even because of her Carnymancy charm. Sylvia was the highest ranking Warlord in Unaroyal's contingent in the Royal Crown Coalition. She served as an advisor to Prince Ansom and was the voice for her side as a member of the Royal Crown Coalition War Council. She was one of only four warlords at Ansom's table on the penultimate night of the siege; Erf-b1-p101 - the others being Duke Nozzle, the Blue Warlord, and the Superfluous Warlord. She retrieved the Arkenpliers from Ansom's body when he was croakedErf-b1-p132 and was in possession of them for a short whileErf-b1-p137 before she croaked along with the rest of the Royal Crown Coalition in the eruption of the volcano. Before she had been officially named, Rob Balder commented that 'Scarlet" is the Jek Tono Porkins of Erfworld. 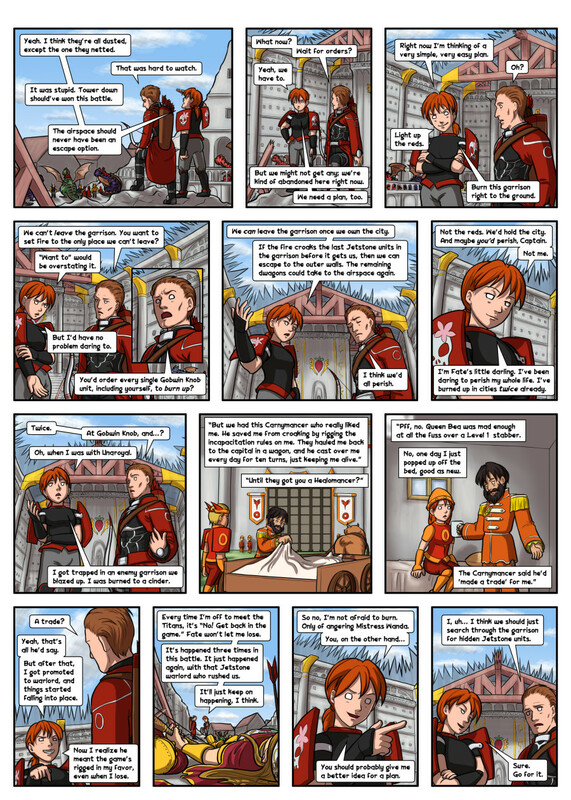 'WoT-6085467, in reference to Sylvia's apparent death by fire in TBFGK 137. Its possible that the bargain Jojo made to rig the rules in her favor are at the expense of other units, so that they are killed so that she is allowed to live. It is also likely that the price of Jojo's spell was to make her fated to croak in a garrison fire, the exact situation he had saved her from. But this would happen at a later time, and would stop her from dying by other means until then. Lady Sylvia Lazarus is a reference to Sylvia Plath, who wrote a poem entitled "Lady Lazarus". The poem in LIAB Text 8 is a direct allusion to it, imitating it closely with just minor alterations to adapt it to the Erfly context. Sylvia Plath herself used the name "Lazarus" as a reference to Lazarus of Bethany, from the Gospel of John. Sylvia has a similar story (but no shared signamancy) to US Coast Guardsman Clifford Johnson who was in the Coconut Grove nightclub fire. He re-entered the burning club 4 times looking for his date Estelle Balkan. Johnson suffered third-degree burns over 55% of his body but survived, setting the record for the most severely burned person ever to survive his injuries at the time. He spent nearly two years convalescing in the hospital and undergoing hundreds of operations. Fourteen years later he burned to death in a fiery automobile crash. This page was last edited on 21 December 2017, at 18:15.